So far this season for the New York Islanders has been a massive disappointment. Unless a miraculous turnaround occurs the Islanders will miss the playoffs and in all likelihood will be looking for a new general manager and head coach. This potential GM opportunity is a plum job in waiting for someone. 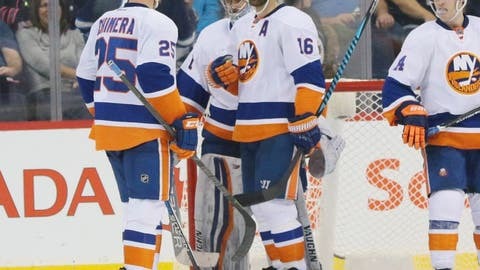 The New York Islanders entered the five-day break with a record of 15-15-6 for 36 points. They currently are near the bottom of the standings in the Eastern Conference. After back-to-back 100 point season this well off the pace that was thought they could achieve this season. With a string of questionable decisions before a puck was even dropped this season (ie: free agency, Parenteau, three goaltenders). It’s safe to say that should the Islanders fail to secure a playoff spot Garth Snow is likely out. This is the first year of the new ownership tandem of Scott Malkin and Jonathan Ledecky for the New York Islanders. Both owners are committed to making this team into a contender. They have big plans for this franchise on and off the ice. Both owners have stated they will spend up to the cap ceiling and do whatever it takes to win. They cannot be happy with how their first-year has gone on the ice. Since the summer the new owners have been interviewing a number of candidates to be President of the organization. With the season the Islanders are having, expect that person to be in place before season’s end. Usually, when a new general manager takes over he doesn’t have a lot to work with. While the Islanders roster needs to improve by no means is the cupboard bare. With the right changes in terms of the head coach, coaching staff, a trade or two, and a mid-level free agent signing, this teams can be a contender as early as next year. Look at the turnaround this year by the Columbus Blue Jackets and the Minnesota Wild compared to where they were a year ago. With the right moves, many of this year’s one-goal losses could turn into one goal wins next season. The Islanders cap currently stands at $71.1 million. In addition, the Islanders will have $20+ million coming off the cap after next season when Josh Bailey, Jason Chimera, Mikhail Grabovski, Jaroslav Halak, Thomas Hickey, and Nikolai Kulemin contracts expire. There will be plenty fo cap space for the potential new GM to lock up the current core Islanders to long-term deals and to add proven talent to this roster. #Isles place Jaroslav Halak on waivers. Some in New York wondering why they don't put GM Garth Snow on waivers. While the last few years the Islanders have been a playoff team that has not stopped them from maintaining a deep farm system. The prospect pipeline cupboard is very deep and full for the potential new GM. The first wave of prospects includes Mathew Barzal, Ryan Pulock, Keifer Bellows, Michael Dal Colle, Ilya Sorokin, Linus Soderstrom, Devon Toews, and Josh Ho-Sang. Most of these players are knocking on the door to the NHL. Expect all of them to be wearing an Islanders sweater in the near future. If that was all of the Islanders prospects any GM would be thrilled. The Islanders also have an impressive second wave of youngsters right behind their top prospects. While the Islanders are in one of the biggest sports markets in North America, 99% of the microscope falls on the Rangers. This alleviates a lot of pressure off the franchise and the general manager. Always easier to do one’s job in a less pressurized environment. Number one on the new GM’s agenda will be to lock-up John Tavares. Tavares is eligible to become an unrestricted free agent after next season. Tavares has stated publicly both here in New York as well as in Canada he wants to be an Islander for life. The new ownership group understands how important their captain is to their organization. This past summer owner Jonathan Ledecky stated in a town hall, Tavares will not hit free agency. Remember the Islanders have the advantage of offering Tavares an eight-year deal, while every other club can only go to seven. This July 1st per the CBA is the earliest the Islanders can sign to a long-term extension. Expect an eight-year deal for around $80 million this summer between Tavares and the Islanders. Any potential candidate should be salivating at the thought of becoming the Islanders next GM. The right couple of moves and this franchise could be a contender for the next decade.